Winter's first melt-down occurred yesterday, Friday, January 27, along the Banadad Ski Trail. The day before the wind shifted to the south. During that night the temperature began to rise and rise. Be the end of the next day, Friday, it was up to 46 degrees. The snow depth dropped from 21 inches to 17. However this morning, Saturday the temperature is again below freezing and more snow is predicted for over the weekend. While the ski trails are a bit icy, they retained their base and the tracks are fine. Skiing even with the melt-down remains very good. sexual energies will subside, God forbid." After this entry other guests continued to write about the exploits of Olga and a myth was born. The second yurt at the Croft Site had to be called - Olga's Yurt. While this second yurt eventually was replace by a rectangular structure the myth is continued to this day as Olga's Hut. Including this blog the Edge, there are now five weblogs being published about the Gunflint Trail and the surrounding BWCA. Two of these blog focus on the Boundary Waters. These include the Boundary Waters Blog written by Sue Prom, Voyageur Canoe Outfitter and BWCAW Blog written by an unnamed person who was raised in Minnesota and now lives in Seattle, Washington. Sue Prom's blog serves to chronicle events and activities as viewed from her home and business located near the end of the Gunflint Trail on Lake Sag. The BWCAW blog reminisce of past trips to the Boundary Waters written from afar. Another new blog is Gunflint Trail History, which is, as of yet, an un-categorized listing of historic information that has been collected by the Gunflint History Project. Until a permanent "Web home" is found, the historical data collect by the project will be stored at this site. Anyone with historical information about the Gunflint Trail is invited to share it through this site. Historical information from the Gunflint Trail concerning individual lakes or business, on pre contact and early settlement, on fur trading, mining and timber operations and interesting individuals are among the items being sought. The newest Gunflint Trail blog to hit the web is Heston's Nature Notes and deals with the day to day goings on of Barbara and Greg Gecas family who operate Hestons Lodge and Country Store on Gunflint Lake. In a current article talks Barbara writes, "It was a busy weekend, with lots of folks up for skiing and fishing. The sauna got a work out at night, and several brave folks jumped through the hole that Paul chopped out in the ice. I saw some photographs, and offered to put them on this blog, but that was declined. I'll try to find a photo of my nephew jumping in, to share. It is quite a thing to see!" The Heston's blog presents an interesting insight into life on the Gunflint trail and a must view for anyone interested in the area. If this was not enough! Sarah Hamilton at Trail Center has as designed and hopes to release a blog on her clothing line soon. Yet another blog focusing on the Boundary Waters', the BWCA Blog put out by Canoe Country.com currently appears to be inactive. Grand Marais, MN: The Second Annual Winter Tracks Festival takes place February 22 - 25, 2006 at a variety of Gunflint Trail locations. Winter Tracks celebrates the best that Minnesota winters has to offer in classic Gunflint Trail tradition. The festival is open to the public and guests of Gunflint Trail resorts, and most of the activities are offered free of charge to registered Winter Tracks participants (registration for Winter Tracks is free). "We have a great time on the Gunflint Trail every winter, and we always try to share that with our guests," says Shari Baker, president of the Gunflint Trail Association. "Not everyone is comfortable trying a new winter activity on their own, so we'll make it easy for people to sample a variety of winter fun, like snowshoeing, dog sledding, snowmobile rides none of which require any special skill or preparation- just warm clothes and a willing attitude. Most of the Winter Tracks activities are free, and if they require any special gear, we'll provide it. We just want people to come out and have fun." In addition to many "intro-to" recreation opportunities, Winter Tracks participants can learn how to carve sculptures from giant blocks of snow (at Bearskin Lodge, Gunflint Lodge and Gunflint Pines), take a dog sled ride (Gunflint Lodge), and race through a snowshoe obstacle course (Golden Eagle Lodge and Gunflint Pines). Other activities offered throughout the festival include cross country skiing, snowshoeing, snowmobile rides and a poker run, broomball, races, a snow sculpture contest, wildlife seminars, guided hikes and tours, a variety of unique dining options and discounts on equipment rental and at gift shops. The resorts and outfitters of the Gunflint Trail offer a variety of lodging options, plus dining, shopping and plenty of friendly hospitality. Visit http://www.gunflint-trail.com to explore the options. A complete listing and calendar of events can be found on the Winter Tracks web site at http://www.wintertracks.com or for more information by phone at 800-338-6932. After weeks of warm winter temperature, this morning the thermometer at Poplar Lake dipped to three degrees. With day time temperature from the mid twenties to low thirty and nights rarely below twenty degree, this has been the warmest January in over ten years. According Dave Clutter who records Poplar Lake weather for the state this year's January average temperature has been 19.61. Compare this to the nine year average of 6.79. We will now have to wait to see how the rest of the month's weather plays-out. However even with the warmer then usual weather there was little, if any, melt down of the areas snow cover and ski conditions remain excellent on the Gunflint Trail's Nordic ski trails. Current ski conditions and addition information on the BWCA's longest tracked ski trail- the Banadad is now available at http://banadad.blogspot.com/. Information on the trail will be regularly updated through the 2006 ski season. Have a good ski! 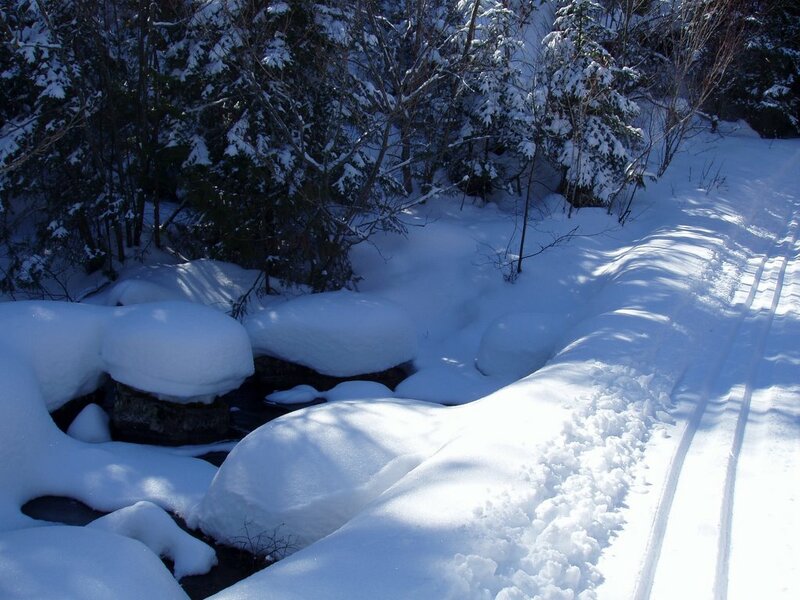 Photo is of the Banadad Ski Trail cross over Banadad Creek 16 kilometer west of the eastern trailhead. A Group of Poplar Lake residents recently met to discuss the formation of a Poplar Lake Association. According to a letter received from these residents, "such an association would provide a means for homeowners to voice concerns, monitor, and perhaps take appropriate action regarding issues that affect the quality of our experience at the lake." Among lake issues cited by the group of concern were, water quality, lakeshore development, surface water use, lake level, waste disposal and fishery management. As a editorial postscript - I think it is a good idea to organize such a group provided it is open to all lake resident and that special effort should be directed to including lake businesses. Further that are many issues of concern to some of us that transcends Poplar Lake but directly affect our lake exerience. One such issues is the current unrestrained management of the forest by the U.S. Forest Service and Minnesota DNR along the Gunflint Trail corridor. Further I urge all Poplar Lake resident to express their interest in forming a Poplar Lake Association. Due to the warm weather and early snow ice conditions on most of the Gunflint Trail's larger lakes including Sag, Gunflint, Seagull, Loon, Clearwater and others maybe unsafe. Other lakes that were earlier this winter safe are now experiencing heavy slush conditions. Those planning to travel on any area lakes should first check with DNR office in Grand Marais 218-387-3057 and/or lodges or residents. The "History Reflections" in the December 30, Cook County News Herald shows a photo of not "some kind of protest" but actually the largest protest demonstration our county has ever witnessed. The demonstration took place on April 14, 1978, when one thousand Cook County, protest sign and American flag waving, residents along with logging trucks and skidders marched from Coast Guard Point to the old USFS offices to protest the proposed Vento-Burton legislation. Howard Joynes, Joynes' Federated Store and others organized the city's businesses and virtually every business in Grand Marais closed for the event. The Grand Marais City Council passed a resolution closing all non-essential city offices and lowering the flag to half-staff. When the marchers reached the Forest Services offices Bruce Kerfoot from the back of a truck proclaimed to the crowd, "We don't have much power. We don't have many votes. This is the only way we can show them what we feel." Charlotte Eckroot (Nelson) stated, "we want to be heard in Washington. We are tired of being stepped on." City Councilor Walt Mianowski next read an eviction notice to USFS District ranger Earl Neiwald and as Neiwald returned to his office, locking the door behind him, the eviction notice was taped to the building door. Mayor Richard Humphrey then took the podium and shouted, "I just heard you say we don't have much power. Well I'm here to announce that they," pointing to the Forest Service's building, "doesn't have any power." With this a crew from the city's Public Utilities Commission cut the electrical power to the Forest Service office and their offices went dark. A thousand cheered went up from the crowd. Headline in the Duluth News Tribune the next day proclaimed, "Grand Marais Shuts Down- 1000 protest BWCA bill." The Vento-Burton Bill as it was called then would have closed all lakes within or partially within the BWCA lakes to any form of motorized use- even Poplar Lake with a small portion of the lake near the Meads Lake portage within the BWCA would have been closed to motors. More ominous the proposed legislation would have placed the Gunflint Trail and other similar areas into a National Recreational Area and empower the USFS to assert zoning control over the Area. The demonstration dramatically thrust Cook County into the center of the fight raging throughout northeastern Minnesota over the Vento-Burton Bill. Under the banner of the Boundary Waters Conservation Alliance the fight continued though the summer. Ultimately and over the objections of the Alliance a modified version of the Bill was passed as the BWCAW Act of 1978. Most Cook County residents were not happy with this new bill but as a result of the fight put up by Cook Country residents and the Alliance, limited motorized use was retained in some BWCA lakes and the provision creating a National Recreational Area was stripped from the Bill. While it has been twenty-eight years since this protest, some things just do not seem to change. The Forest Service continues to plod along without regard to what local people need or want. Important snowmobile trails are closed with little concern to finding an acceptable replacement route or if replacement routes are found the routes take years to approve. The Forest Service continues its de facto expansion of the Wilderness, this time through the Roadless Area program. Along the Gunflint Trail their controlled burn program is more of a blight than a control and in the process some of our area's finest hiking and skiing trails are destroyed. Even the Forest Service's reforestation plan promised following the July 4 Storm has been willfully lacking. It is no wonder the locals are getting restless again. SNOW DEPTH IN WOODS: 16-17"
COMPACTED BASE ON TRAIL: 9"
NEW SNOW PAST 24 HOURS: 2"
NEW SNOW PAST 7 DAYS: 4"